For once, I am very proud to be a "Basler", because the best Melodic Black Metal - Band of little Switzerland comes from here: Basel. 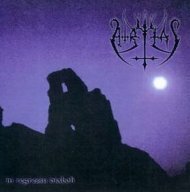 Atritas have quite a big status in the underground and "In Regressu Diaboli" is their 4th Demo, but still the band wasn't lucky enough to get a deal with a label. That's something I don't understand, because so many bad bands get a deal, and real talented groups like Atritas stand alone in the dark. But enough of that, let's come to the music, which is absolutely great. The sextet plays a very own kind of Melodic Black Metal, sometimes a bit reminding to old Dimmu Borgir or Cradle Of Filth. The keyboards are never too loud, they never suppress the other instruments, most of all the guitars. No, fact is, that the keyboards are more than just this 08/15 - strumming, sometimes, in their way, they remind to Judas Iscariot (R.I.P.). The music is a perfect symbiosis of spherical keys, cold-melodic guitars and parts full of hateful blasting. The only thing which isn't good with "In Regressu Diaboli" it that the sound is not loud enough, you really have to turn up your CD-player, and sometimes, the production needed more pressure. But that's a detail. For a Black Metal-fan, Gier's voice is a delight, it's such a high, extreme, hysteric and kind of mad screaming. The guitars are played competent and variable, just the bass is not so good to hear. Another very good thing is the drumming of Ork, he's able to perform very precious and exact blastbeats. The album starts with a mystic keyboard-intro, then Gier screams and blastbeats dominate. Already here show Atritas the perfect change between fast tempo and midtempo, and Gier sometimes speaks clean. The key is in the background and lays the atmosphere. Then suddenly, again fast, aggressive vocals and great lead guitars, also a little solo is here. A good start! "Das Tier" starts slow, with a sad, dark melody, deep vocals, an acoustic part appears, and then hell breaks out! Blasts and high screams, and the typical, brain-freezing guitar-melodies, which never let you go again. Hateful, but also beautiful. Most of the time, the song is fast, dominated by the guitars. After about four minutes, there's a key-part, which reminds me to the "Heaven In Flames"-album of Judas Iscariot (R.I.P.) and "Das Tier" gets slower, before it burns down everything again. Also good to hear is a hysteric scream, and the start-melody returns. "Primat Des Geistes" is aggressive from the first moment on and this song contains the best lead guitars of "In Regressu Diaboli". Gier changes again between growling and screaming, and the whole song spreads a dark, mystic and kind of occult atmosphere. The keyboards are origin, sometimes just accompanying and sometimes sounding like a bell. "Vanitas Atra" starts with a cool keyboard-intro, first it's midtempo, then very fast, and again changing into uptempo. During the song, there's a great keyboard-intermezzo and a bangy, melodic part appears. The lead guitar is again freezing and destroying, and the fastest part of the whole CD is at the end of "Vanitas Atra". Another great Keyboard-part opens the titletrack, which is slow at the beginning. During a little moment, the guitars sound a little bit thrashy, before the Black Metal-style returns. The drums are fat and pounding, and in the titletrack, sometimes the keyboard makes the whole melody. A slow, Gothic-like part also appears and fits very good, before the blastbeats rule again. Another great song. At the end, another intensive, depressive melody appears. The last song starts with clean guitars, but of course it turns into blast and also "Recke Satans" contains a lot of tempo-changes. The best part is, when the song is in midtempo, with hellish screams, atmospheric and one more a great guitar-melody. The keyboard is often very epic and majestic in this song, and there's also a cool drum-break. A great end of an indeed very good Demo-CD.